Aylsham Windmill01263 732118work Self-cateringOld Windmill (1826) converted into 3-bed holiday accommodation. Winner of Broadland District Enhancement Award for Historical Buildings 2000. On the ground floor is a cloakroom and a utility room with washing machine, tumble dryer and freezer. On the first floor is an open plan lounge, kitchen, dining area. On the second floor is a double bedroom and a twin room with a shared en-suite shower room. The third floor has the King sized bedroom with en-suite bath and shower. There is a private patio area with BBQ. Private parking for up to 3 cars. Aylsham is ideally placed to explore Norfolk. Approx 10 miles from the beach, Norwich and the Norfolk broads. Wildlife reserves and National Trust properties close by: Norfolk Wildlife Trust's Cley marshes are a must for birdwatchers, and the National Trust's Felbrigg and Blickling Halls both a few minutes’ drive. Easy access to walks and cycle rides - close to Marriott's and Weavers' Way. Good pubs and restaurants nearby. The old market town of Aylsham has origins as far back as the Saxon settlement of Aegel's Ham at around 500AD. There are signs of habitation going back to prehistoric times. The Manor of Aylsham was given to John of Gaunt by his nephew King Richard II in 1372. The market square is now owned by the National Trust. See our web site to BOOK ONLINE, and check details for short breaks. Aylsham Windmill from the side driveway. view from the side entrance off Mill Pightle. 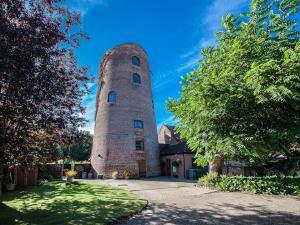 Old Windmill (1826) converted into 3-bed holiday accommodation. Winner of Broadland District Enhancement Award for Historical Buildings 2000. We are on the B1145 on the outskirts of Aylsham. From Norwich, take A140 to Aylsham / Cromer roundabout. Turn left at roundabout. After about half a mile, turn right on to the B1145 at sign for town centre/Saxthorpe. Take 1st left after entrance to St Michaels Close (concealed entrance). From Norwich - 10 miles. Buses available from Norwich bus station. From Norwich train station you can get a train to Wroxham and take the Bure Valley train to Aylsham. Or get a train to North Walsham or Cromer and get the bus to Aylsham. allergy sufferers know that building is pet free.